This session will discuss the considerations for ensuring reliability and availability for positioning technology in IoT applications. Performance and security issues will also get covered. Rahul Gupta is a Market segment manager at Spirent Communications’ Positioning Technology division, leader in GNSS test solutions. Prior to joining Spirent, he has held various marketing and engineering roles in leading wireless test and measurement companies. 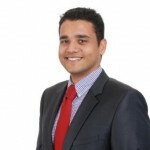 He holds a 1st Class Honours degree from the University of Hertfordshire in electronics & communications engineering and an MBA from University of Cranfield.